others may not allow them. If disposals are used with septic systems, more frequent maintenance of the septic system may be required. If a disposal is more than three years old, it should be replaced. Typically if a disposal is removed and left in a non-operational state for a few weeks, the seals will dry and metal bearings may rust, causing the device to fail when reinstalled. DISHWASHERS Dishwashers are energy- and time-saving de- vices that most clients want installed. Usually a dishwasher is positioned as a built-in next to the sink and wired to its own electrical circuit, or shared only with a disposal. 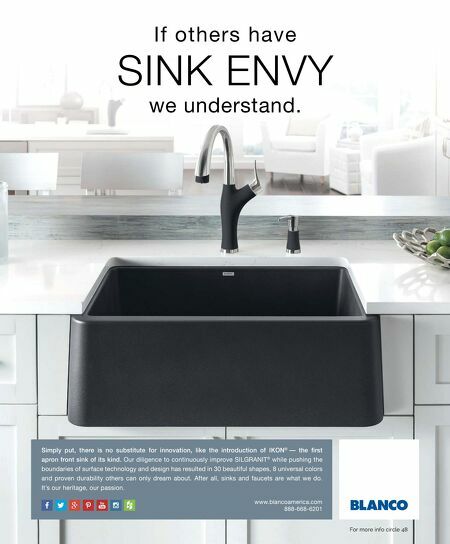 Factors to consider in the selection of dishwashers are the level of noise generated, the best location based on use, and how it will be concealed. New, high-tech dishwashers re•ect the move to modularization, as they can be mounted in a stacked, pull-out drawer combi- nation or as a side-by-side system. In a smaller kitchen, single drawer models can be used. Modular dishwashers require special cabinets for installation, and mounting must conform to manufacturers' speci-cations. For home- owners with back problems or who are wheel- chair-bound, the modular dishwasher may be lifted higher o€ the •oor for ease of use. APPLIANCE DISPOSAL If you will be responsible for disposal of used appliances, ensure adherence to proper pre- cautions. Some contractors donate working appliances to local charities and provide the receipt to the client. Others sell them to scrapyards. | one of these built-in dispensers, be sure to plumb a water supply to a location near the refrigerator. Side-by-sides will also reduce the amount of door projection into the kitchen, but the doors tend to block access to the coun- tertops on both sides of the refrigerator. Built-in refrigerators are becoming more available. †e units are typically 24 inches deep and tend to be much wider than stan- dard-depth refrigerators to hold a compara- ble-size food load. †e upside to these units is that panels can be installed that enable the refrigerator to match the kitchen cabinets. †e price of built-in refrigerators is typically higher than a comparable standard unit, but using built-ins can have a dramatic impact on the kitchen. †e cabinet above a refrigerator should be 24 inches deep to optimize the storage space usage. It is recommended that you measure the physical unit before ordering. Refrigerators that support the use of wood panel inserts require you to exercise care when matching the inserts to the cabinet panel. If the color or grain do not match, it can cause a distraction. Modular units have appeared on the market recently and enable refrigerators to be placed next to the location where their contents will be used. †e inclusion of modular refriger- ators must be planned at the design phase. When installing these units, be sure to note all clearances and safety precautions listed in a manufacturer's installation instructions. FOOD DISPOSAL Like most appliances, the price range of dispos- als will vary. Lower-end disposals tend to have less power and are very noisy. Higher-quality products have a better level of sound dampen- ing and tend to have larger motors and cavity capacity. Determine if noise is a consideration and estimate the amount of waste clients will create. Check local code concerning disposals; some communities may require disposals while ast month, we began the discus- sion about kitchen remodeling ma- terials with cabinets. †is month we will discuss appliances, which after cabinetry represent the second most ex- pensive component of the kitchen remodel. COOKTOPS, OVENS, WARMING DRAWERS AND RANGES Cooking is the purpose of the kitchen, so choosing equipment that enables the home- owner to cook should be based on practical considerations. †e question of which appli- ance or appliance combination best suits the workspace and the owners' cooking style can be determined using a systematic approach. First, choose between residential and com- mercial equipment. Next, select the appliance style: built-in, dropped in or slide in. †en, specify the type of ventilation system and determine whether the heat source is gas or electric. And -nally, the method of heat trans- ference: convection, conduction or radiation. REFRIGERATORS Refrigerators are available in a number of styles and sizes. With advances in technology, the placement of refrigerator/freezer systems allows more •exibility for the designer but may bring challenges for the installer. †e selection of the refrigerator must be complet- ed before the cabinets are ordered to ensure proper cabinet selection and placement. Most refrigerators require a minimum space between 1 and 2 inches above them to allow for proper compressor ventilation. In addition, the bottoms of these units need to be kept free of obstructions, as air•ow restrictions can severely reduce the life of the refrigerator. As a general rule, separate refrigerator/freezer combinations take more space than a combo. Side-by-side refrigerator/freezers have be- come very popular. Many have water and/ or ice dispensers built-in on the door. 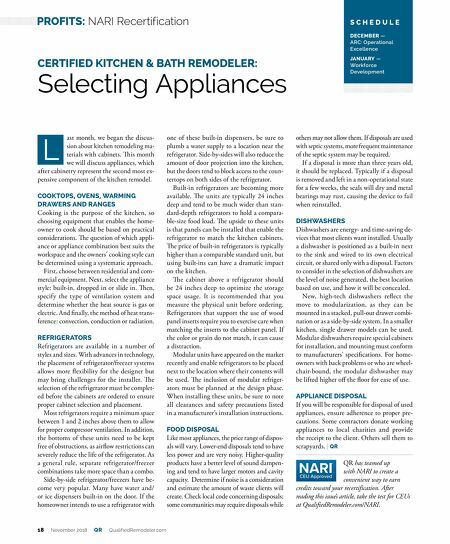 If the homeowner intends to use a refrigerator with L CERTIFIED KITCHEN & BATH REMODELER: Selecting Appliances S C H E D U L E DECEMBER — ARC: Operational Excellence JANUARY — Workforce Development 18 November 2018 QR QualifiedRemodeler.com PROFITS: NARI Recertification QR has teamed up with NARI to create a convenient way to earn credits toward your recertification. After reading this issue's article, take the test for CEUs at QualifiedRemodeler.com/NARI.